I am such a sweet lover. The idea of having cake in minutes sounds great to me. The other big pay off – no pan or bowls to clean. I'm with you sqkecleen! There was only one extra mug in the dish mountain growing in my sink — not enough to cause an avalanche! Wow that sounds great!! 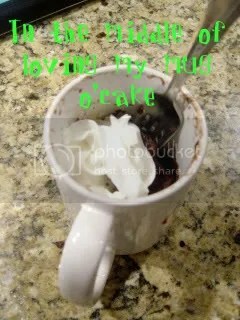 I love choclate, and to have choclate cake in minutes YUMMMM!! Love your poem too!! That sounds so good. I hear a jumbo coffee cup of cake calling my name now! I feel I have been visited by a celebrity! Not believing cake in a mug could be topped — I see you now offer Booze in a Can. YOU ARE MY IDOL!